Mike Ullery | AIM Media Midwest The inaugural “Good night lights” kicked off at Dayton Children’s Hospital on Tuesday as police, fire, and EMS units from around Montgomery County converged on the hospital to “wave” goodnight to kids. Tuesday’s kick-off included a fly-over by CareFlight. The good night waves will take place every Tuesday. The inaugural “Good night lights” kicked off at Dayton Children’s Hospital on Tuesday as police, fire, and EMS units from around Montgomery County converged on the hospital to “wave” goodnight to kids. Tuesday’s kick-off included a fly-over by CareFlight. The good night waves will take place every Tuesday. 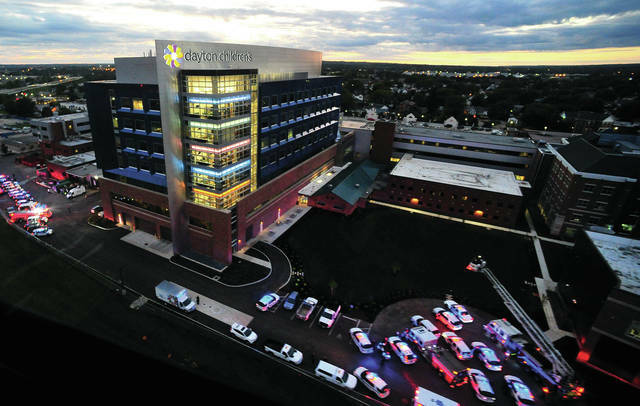 https://www.dailyadvocate.com/wp-content/uploads/sites/34/2018/09/web1_091118mju_careflight_childrens.jpgMike Ullery | AIM Media Midwest The inaugural “Good night lights” kicked off at Dayton Children’s Hospital on Tuesday as police, fire, and EMS units from around Montgomery County converged on the hospital to “wave” goodnight to kids. Tuesday’s kick-off included a fly-over by CareFlight. The good night waves will take place every Tuesday.